At the recent UCU Left conference, “Defending Education: building an autumn of resistance”, I was adopted as candidate for General Secretary of the University and Colleges Union (UCU). I’m a rank and file activist in the union, and I am well aware of how much is now at stake for all UCU members and for future generations of students and staff. I believe that the UCU and all of its members must now be committed to a defence of public education, and to a defence of open access to it. I’m committed to the robust defence of Further, Higher and Adult education as we face unprecedented attacks on colleges and universities and a reimposition of elite provision for a minority of students. I believe that there is no significant distinction between the defence of the quality of education and the defence of pay, jobs and conditions. The defence of one requires the defence of the other. I believe that the UCU has a key role to play in mobilizing a wide coalition of forces that are opposed to the Government’s dystopian agenda. It needs to appeal to other trade unions in the sector, to students and their families, and to all in the wider community for whom the Government’s assault on post-16 education, and education’s reorientation toward business training, is both a betrayal of hope for millions, and an assault on an inclusive and democratic society. I’m committed to helping to mobilise all UCU members to take united strike action alongside millions of other public sector workers on 30th November in defence of pensions, and to encouraging the links with other trade unionists, with our students and with anti-cuts campaigners. This is the unity and the determination that we will need to defeat the Government’s plans to privatise post-16 education and to subordinate it to market principles. I’m Chair of the UCU Coordinating Committee at London Metropolitan University where I work as a Senior Lecturer in Computing. I’m UCU London Region Rep on the South East and Eastern Regional TUC and Vice-Chair of its Public Services Committee. I’m a member of the UCU’s National Executive Committee (NEC), and have served on the Recruitment, Organisation, and Campaigns Committee (ROCC) for the last four years, and have represented UCU at the TUC Congress for the past three years. 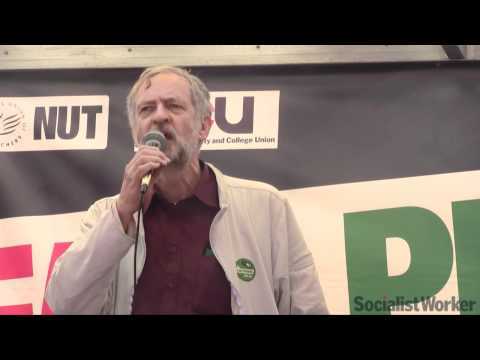 I have been in the forefront of the fight to defend jobs and courses at London Met and have played a prominent role on the NEC in defence of pensions, pay and members’ conditions. If elected as General Secretary, I pledge to only draw the equivalent salary to my current lecturer’s salary plus any increases we win for our members, the rest to be donated to the union’s strike fund. As a rank and file activist I’m committed to ensuring that we elect a leadership that is unafraid to stand up to the Government and to the employers. I am committed to organising the kind of political and industrial action needed to defend educational principles, and to defend our members. In the discussions in the union that will take place during the coming months I will urge UCU members to elect national union officers and NEC members who will always abide by the democratic decisions of members at Congress and Conferences. If elected, I will seek judiciously to use the union’s industrial strength and its political influence to defend contractual terms, security of employment, and equality for all staff and students. I’m committed to a democratic, member-led union that will campaign and organise collectively to defend both the principles of wide access to, and a democratic ethos in, education. A key part of that struggle will be a defence of members’ jobs, pensions, pay, and conditions. Mine is a vision of a leadership for the UCU that is committed to collective campaigning rather than one seeking to develop an individual servicing model that is over-reliant on casework. Mine is a vision that seeks to play to the organising strengths of the union rather than to focus on appeals for sympathy. UCU members hold diverse jobs within various sectors. However, all are campaigning to be treated respectfully as professionals; to have job security, and decent salaries that truly reflect the work we do; to have a clear career path; to feel part of an integrated and diverse workforce where all our voices are heard; to have sufficient control over what we do and how we do it. These concerns mirror those of other public sector workers such as health professionals, school teachers and civil servants. I believe we should stand together in solidarity with those workers when their jobs and conditions are under attack as in doing so we not only help them in their struggle but develop our own strength and win solidarity for our own battles. I will seek to unite the union on an agenda for resistance to Government policy, for defence of jobs and conditions and equal rights at work for staff and our students, and for an open and accountable educational system that is oriented on social benefits rather than private interests. Mark has a campaign blog here.